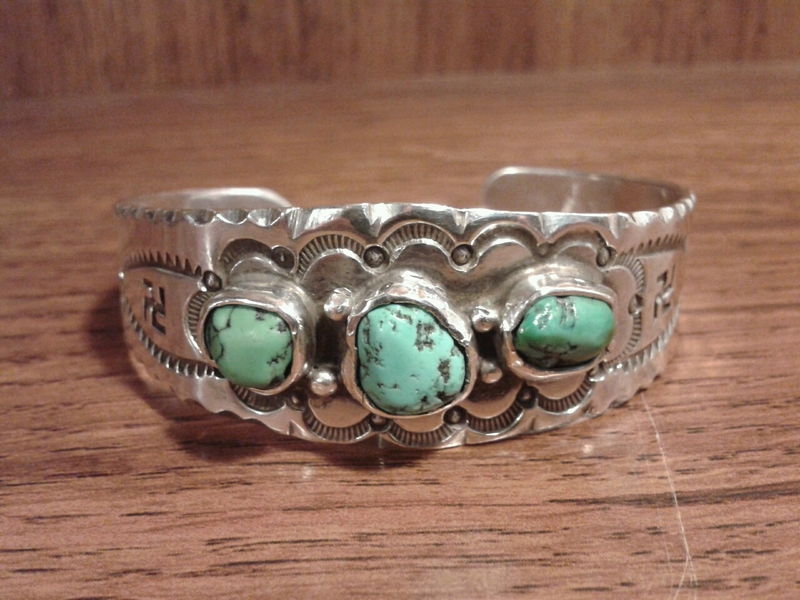 These are the photos of the Whirling Logs turquoise silver belt buckle I had e-mailed you about. The buckle is approx. 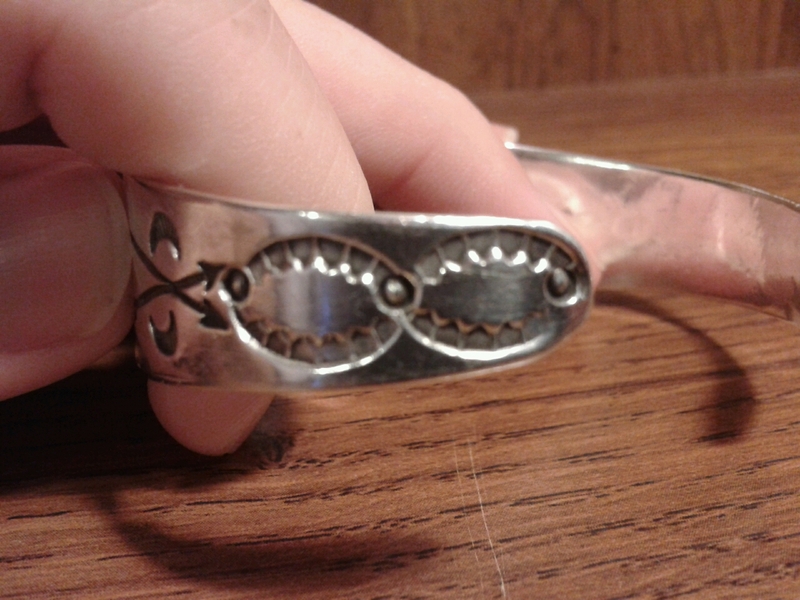 3 and 3/4 inches wide by 2 and 1/2 inches tall. The second photo — of the bear claw hallmark on the back — isn’t great, but I have no photo tweaking programs and I am about as computer illiterate as a person can be. I hope it will do. I don’t know what the black pen mark “135—” means on the back of the buckle; I inherited these items from my father and don’t know if that’s what he paid for it back in the 60s or 70s or what. I would like to know more about the piece: its age, what the hallmark means, et al. First of all, what a nice treasure to inherit from your father. I’ll mention some things I can tell from the photos and some things I can’t determine from photos. 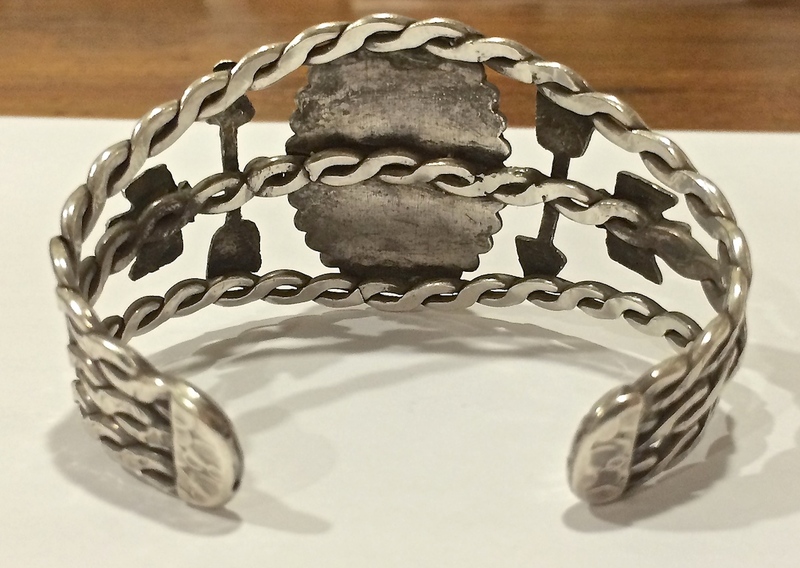 First of all, whether or not this is sterling silver or a lesser silver (such as coin silver) or another metal can be determined by a simple acid test. Any jeweler can do this for you. Knowing the metal content will impact the value of the piece, so it is always good to know what you have that way. Reference “Not All Silver is Created Equal”. 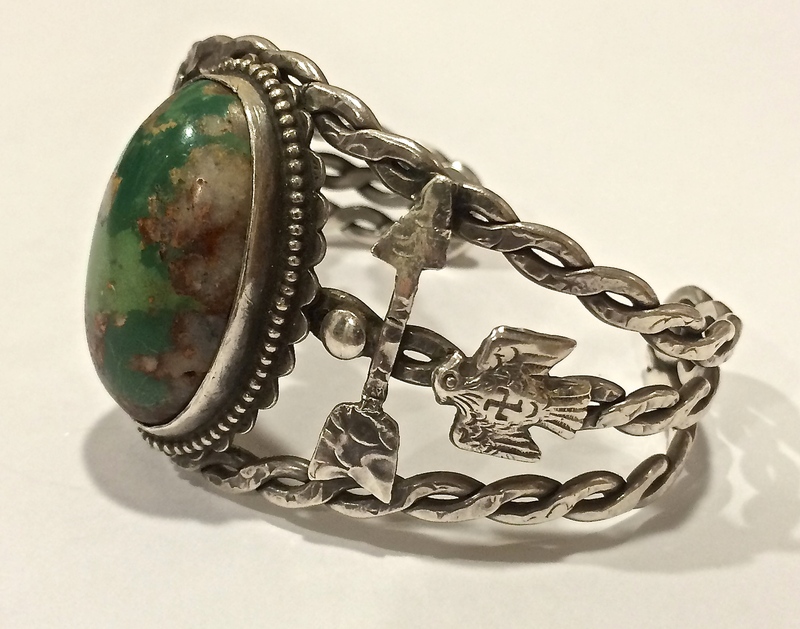 As far as the stones, they appear to be natural turquoise stones set in smooth bezels. As far as what mine they would be from, I’d be guessing just using this one photo, but they are full of matrix and character and nicely placed. References “Types of Bezels” and “Turquoise Mines in the US” and “Green Turquoise”. The magic marker number on the back is indeed the price. 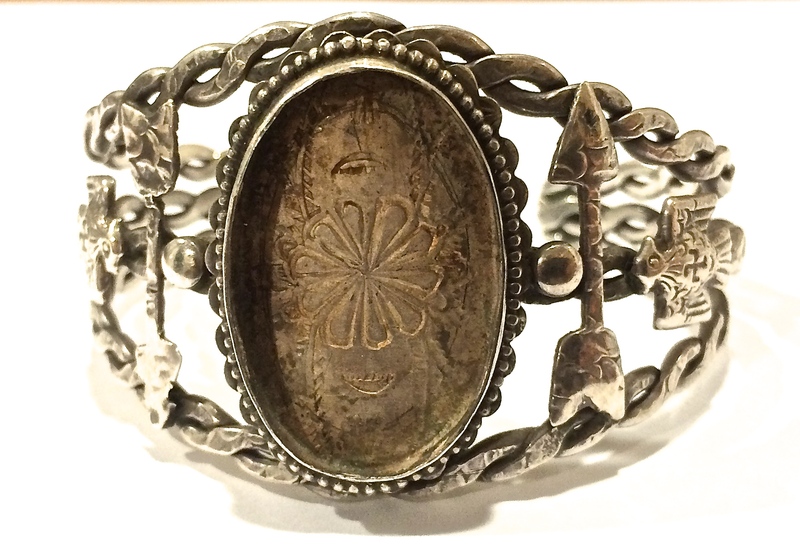 I’ve always thought that it is an odd way to mark a piece of art, but that has been the tradition with much Native American jewelry. So that is likely what the asking price was for the buckle back when your father purchased it. 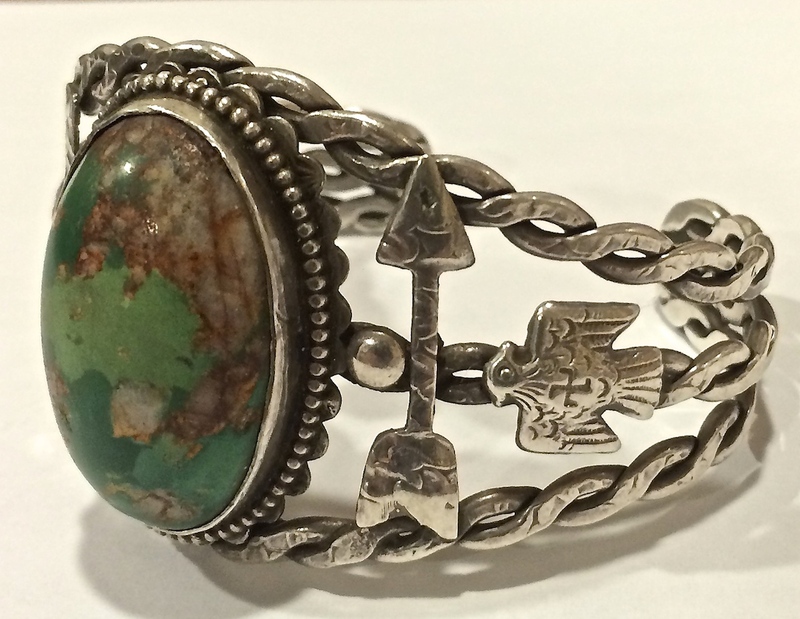 Whether or not he paid that much, we don’t know because negotiating prices on Native American jewelry is common with many buyers – almost a hobby with them. 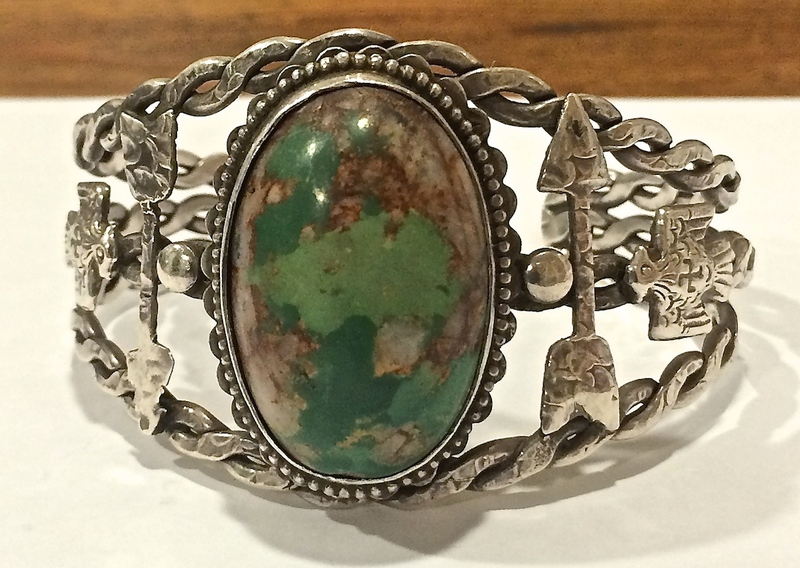 The piece seems consistent with the era you suggest – 1960s to 1970s..
I’d say it is a Navajo made belt buckle. 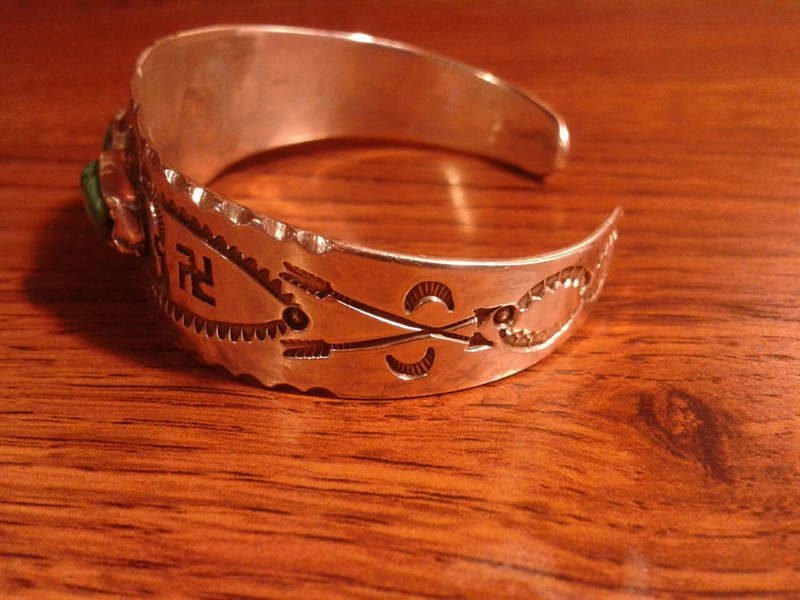 The hallmark is similar to many Navajo and Hopi badger or bear track hallmarks I have seen yet I don’t know of one that is exactly like this one, so I am afraid I have come up empty on the artist. Enjoy that unique belt buckle !